Necessity is the mother of Invention .Truly applies in a kitchen , where all elements of a typical corporate world - Supply chain, inventory management, housekeeping, human resources, budgets, planning, entertainment, resource allocation - all happen simultaneously and endlessly !! One of these days, when we were tired of making sabjis, and wanted to have something quick, I thought of making Paruppu Podi (mixed lentils spice powder).. 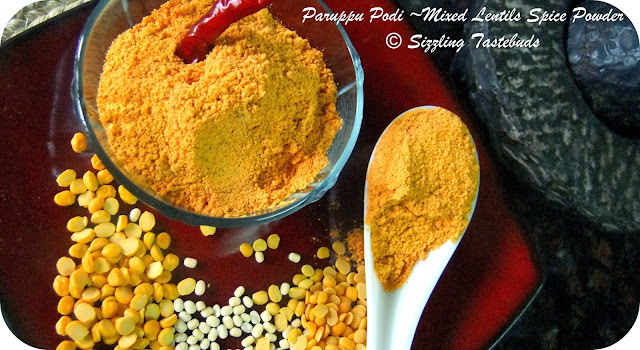 While Molagapudi / Molagapodi (accompaniment to Idli / Dosa) is used with Idlis or Dosas , Karivepalai Podi ~ Curry leaf Spice Powder and Paruppu Podi tastes divine with plain steamed rice and a drop of sesame oil (for kids, you could use ghee / clarified butter). 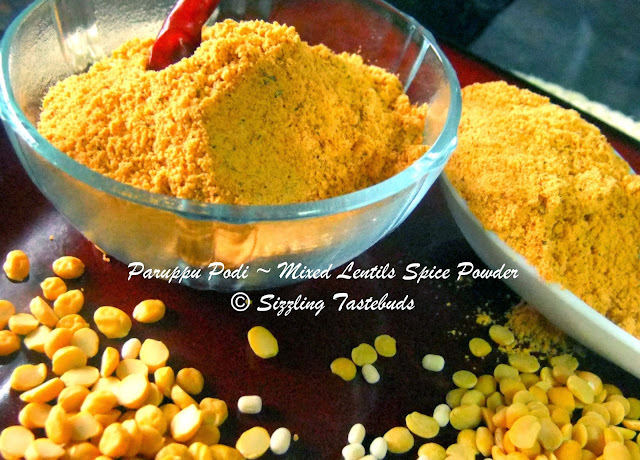 I make this podi (spice powder) in small batches always , to ensure it stays fresh.. This is a very easy recipe and goes to the following events, apart from Blogging Marathon (Day 6) under "Cook with 5 ingredients or less" theme. Checkout my fellow marathoners here. This is made in many many different ways in each household, depending on the spice / taste quotient. Some use only Toor Dal (Split Pigeon pea) , some Urad (split black gram) and Toor dal, but I do add a bit of Channa Dal (Bengal gram) for a variation. 3) Now coarsely pulse the lentils in a spice grinder. Break the fried chillies and add them along with salt to the spice grinder. Pulse again to semi- coarse texture. 4) Cool and store in an airtight glass container. 5) Serve with hot rice and ghee / oil. Check out my 100th post giveaway. This one looks so easy to make and mouth-watering...delicious! Looks lovely mouth watering colours. the pictures are perfect for this lovely podi!!! this is one of my fav podi with rice.. good one..
wonderfully rich color - delicious looking! My fav anytime,full of flavours..
Love the bright yellow color of the podi. Looks yummy. Lovely colour and easy preparation!!!!! I love this podi...In general, I have a weakness for podi and hot rice. Thank you for sending this delicious podi to my event. I usually buy it from the Indian store but I will try making it next time. Do you still want to host B2B for the month of Jan? Let me know and I will add your name to the host line up.